Danbury Hospital Emergency Medical Services will offer a Basic Emergency Medical Technician (EMT) Course starting on Monday, October 1, 2018. Emergency training resources far exceeds state requirements and national EMS programs by providing course participants with more hands-on experience and follow-up with real world practice in the Emergency Department and on ambulance vehicles along certified EMT’s and paramedics. During EMT training, course participants will gain the knowledge, skills, and abilities that are necessary to be a valuable part of the emergency healthcare system. Upon completion of the course, participants will be qualified to take the National Registry exams to receive a Connecticut and National EMT-B certification. This three-month course meets every Monday, Wednesday, and Thursday from 6:30 PM to 11:00 PM and occasional Saturdays from 8:00 AM to 4 PM. 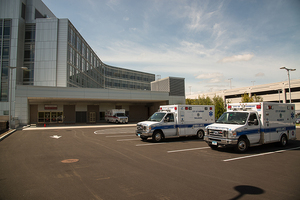 Parking for course participates is in the Rizzo Parking garage located on Hospital Avenue; Enter and exit Danbury Hospital using the Buck Pavilion Main Lobby on the 5th Floor. $895.00 includes both course and work book materials. Payment must be submitted in full before the start of the program. All students will be subject to a criminal background check before classes begin. Bank check, money order, or credit card is an acceptable form of payment. For information and to register for the Basic Emergency Medical Technician Course, visit the website.